Click on the cover to view the entire digital version of the May SKATING magazine. Every month we will unveil the new cover for the upcoming issue of SKATING magazine. 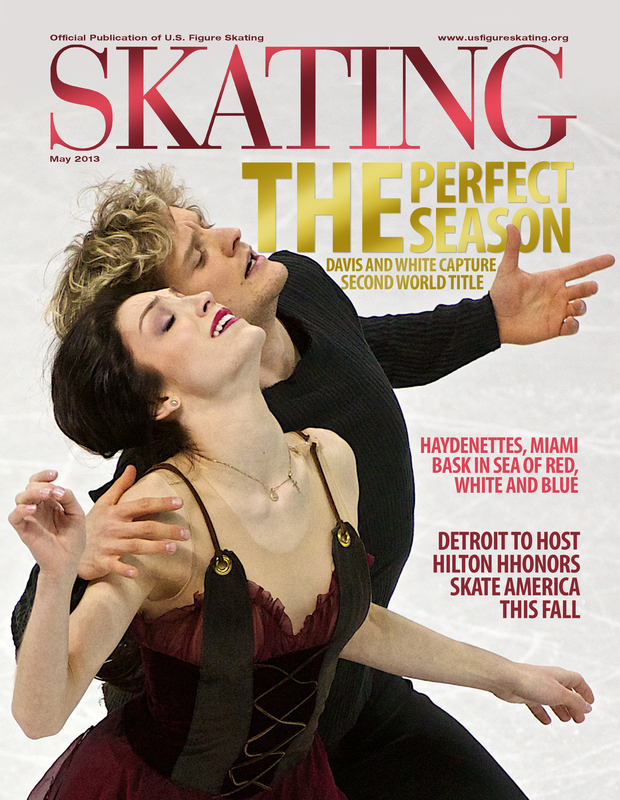 Here is the cover for the May issue featuring World champions Meryl Davis and Charlie White. Editor’s Note: For the last 16 years, Cheryl Davis and Jacqui White have traveled the world together, supporting their children from their first steps as a team to becoming the faces of American ice dancing. 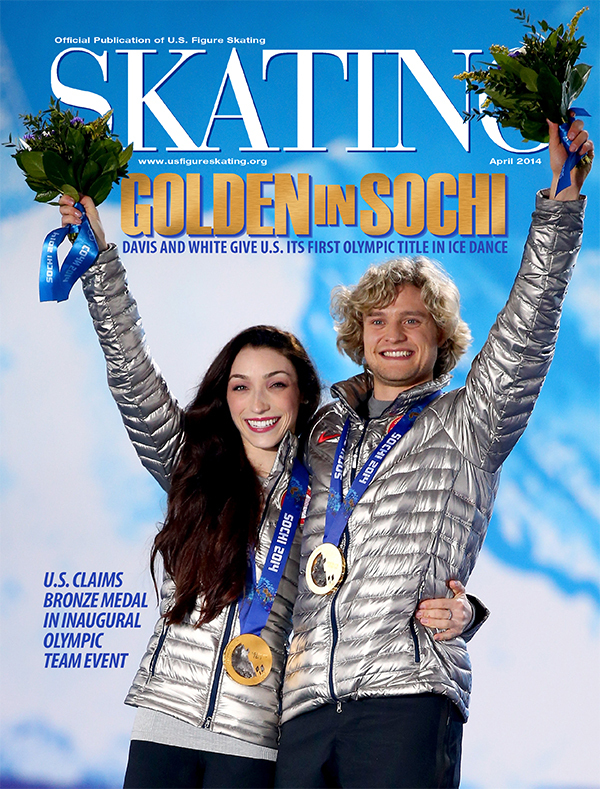 In March, Meryl Davis and Charlie White claimed their second World Championships gold medal, making them not only the first U.S. ice dancing team to win one title, but two. Here, Jacqui shares their experiences at the event. There are moments that are beyond words. Moments that can only be understood on an emotional level. I have to admit, I had a very hard time writing this blog about my experience at the World Championships in London, Ontario.. I just couldn’t put into words the emotional roller coaster that I experienced at this event. It took me a while to sort it out before I could put fingers to keyboard. Right off the bat, we started on a different path by driving instead of flying the 139 miles to London in three different cars: Cheryl with Meryl, Charlie alone in his car and me with the Finnish team. We dropped the skaters off at the Hilton Doubletree, where Cheryl and I picked up our bus passes before heading over to check out our hotel, which was about 10 minutes away. We weren’t sure what to expect when we came around the winding road and long drive to the Windermere Manor, but Cheryl and I share a love of old, quaint places with character, and that’s exactly what our hotel was. It was perfect. In a separate wing of the building was a cafe that had a sun room with a lovely tree-filled view and a cozy indoor area with a fireplace. Of course, the food was terrific and, as we discovered all over London, the people couldn’t do enough to please us. Cheryl had visited family in London many times, so she acted as my tour guide when we drove the route to our kids’ hotel twice a day. I would describe it as “Old London” meets the down-home charm of Mayberry, USA, with lots of mom and pop shops and restaurants. We traveled on the bus with the skaters to the practice sessions and things couldn’t have gone better. Meryl and Charlie skated their programs beautifully and so did all of the other dance teams (at least in my humble opinion). We tried our best to enjoy this moment before the competition started. On the day of the short dance, Cheryl and I rode the bus to the arena. Meryl’s dad, Paul, was to meet us there. Cheryl and I were nervous wrecks. We gave our kids good luck hugs and headed inside to watch. The Budweiser Garden was packed and the crowd was warmed up by the time we took our seats. We sat with the family, which is rare. Everyone that has been to competitions with Cheryl and me knows that you can’t speak to us. It’s a rule; we cannot abide anyone interrupting our focus on the skating, except each other. We whisper back and forth throughout the event. I call out the scores while Cheryl jots them down on a scrap of whatever she has on hand. This is mainly to have something to do to help handle our nerves. It’s funny how 15 years of competition hasn’t helped us. We’re even more nervous now than when they started competing. Fortunately, our families are very kind and understanding of our nervous quirks. The crowd was warm and cheered for all the skaters as they went through their short dances and cheered wildly when the fifth warm-up group came onto the ice. This group included both Canadian teams and Meryl and Charlie. Cheryl and I glanced at each other; Meryl and Charlie were skating first in their group. My heart was in my throat and Cheryl was nervously tapping her foot. The Giselle music began and we held our breath. Time stood still while I watched my son skate across the ice with his delicate partner, lifting her and spinning her around effortlessly and beautifully to the music. Then they stood in the center of the ice for the cheering crowd. They knew and we knew they had skated well, the way they had trained, and it showed on their smiling faces. Cheryl and I jumped up and hugged each other with relief and tears. Meryl and Charlie won the first round, the short dance, but we knew it was far from over so we rejoiced like there was no tomorrow. Friday night, Paul, Cheryl and I had dinner with our friend and seamstress, LuAnne, and her sister, Bonnie, at our cafe. We ate, drank and laughed for hours until everyone else was gone. The cafe staff was great and encouraged us to stay as long as we wanted. We stayed very late because we knew the next day we faced the free dance. Saturday, reinforcements arrived in the form of my husband, Charlie. He brought our daughters, their husbands and our grandkids Avery and Vince (big fans of Meryl and Charlie). I welcomed the extra support and voices for cheering. Paul and Charlie rode the bus with us and the skaters to the arena, but my nerves were not feeling better. They went to sit with the family and some loyal friends. Cheryl and I took our seats; we were on our own. Our hearts rode on the edges of their blades. We felt every edge and glide in our souls. We, “the moms,” have been on this ride with them from the start. We know what this meant to them. At that moment, it meant the world. With the first strains of music, the arena was quiet. Cheryl and I were hanging on by a thread as our kids skated through their free dance with speed and passion. We had faith in them even though we couldn’t breathe. They finished their program exhausted and exhilarated to a standing crowd and skated to their coach, Marina. They awaited their scores with that face of innocent anticipation. There. They had done it. They won the World Championships. Cheryl and I danced and cried in each other’s arms awhile before we turned to our phones to call the dads. It’s an emotional roller coaster. One we wouldn’t trade for the world.